The Polar EXT (Extreme Trail Series) is the newest member of the Kodiak Winch family. Featuring a heavy duty synthetic rope, wireless remote control and waterproof solenoid, it's designed for off-roaders who enjoy crossing creeks and trail riding in muck and mud. The Polar EXT is built tough with all metal gearing, automatic load-holding brakes and fast performance line speed. 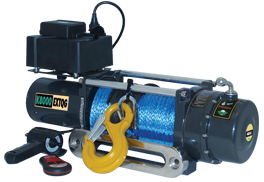 Each winch comes with the Bear Essentials kit that includes two shackles, a two ton tree saver, winch gloves and a Kodiak winch bag. Overall Dimensions: 22.5" x 6.6" x 11"